I am way behind on posting at the moment. So this is for last Friday’s 40 Great Nail Art Ideas group where the theme was food. I’m not sure if these citrus nails are oranges or lemons. They’re lemon coloured, but stamped over orange. So they could be either. The base is Barry M Mango – another fruit to just confuse things even more! It’s a lovely pale orangey (not lemony) colour. 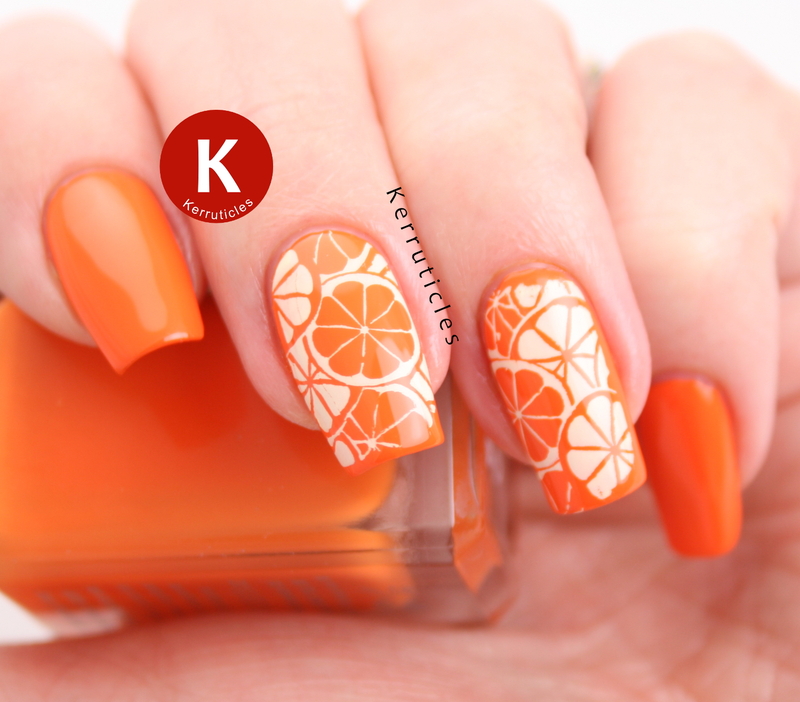 Citrus nails: are they oranges or lemons? I stamped using Mundo de Uñas Cream (12), but this stamping polish has always been more yellow than cream, so it worked nicely. I messed up the ring finger nail a bit. My Mundo de Uñas polishes pick up best, and with the best clarity, when I use my original Konad stamper. But I’m a bit out of practice with it now, since using squishy stampers for many years, and so it was difficult to roll it well enough so that it covered the full nail. Moyra Stamping Polish Top Coat was sent to me for review. All views expressed in this post are my own, honest and unbiased opinions. I love citrus so this is perfect to me!! Must get that plate. That orange is beautiful! Wish Barry M was available more in the US….